Soften the gelatine in the water and set aside. Place the extra water and sugar in a small saucepan over low heat and stir, brushing down the sides of the saucepan, until the sugar is dissolved. Stir in the orange juice, passionfruit pulp and gelatine mixture and strain. Pour into 6 x 100ml glasses and refrigerate for 2 hours or until set. To serve, top the jellies with the extra passionfruit pulp. Makes 6. * When buying passionfruit, look for small fruit with deep purple skin which is quite leathery and wrinkled. This indicates ripeness. Panama passionfruit, which are slightly larger and have a less tart flavour than the regular variety, do not have wrinkled skin when ripe. Choose panama passionfruit which feel heavy for their size. 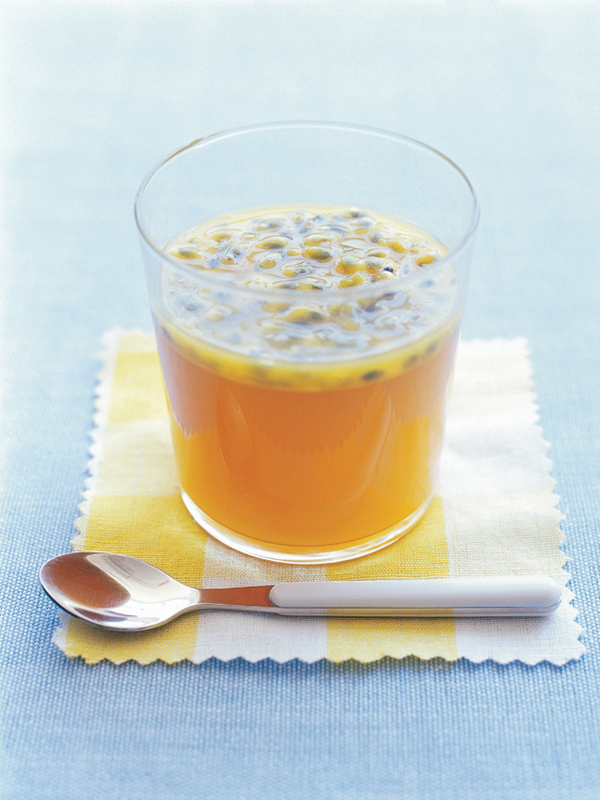 You will need about 24 passionfruit for 2 cups pulp or you can buy canned passionfruit pulp from supermarkets.